A spark can ignite a revolution. Tommy and Careen have been vilified in the media for the Resistance's failed attempt to take down the Office of Civilian Safety and Defense. Both teens struggle to survive the circumstances that thrust them into the national spotlight, and this time, they don't have each other to lean on. They're on opposite sides. Even though both the OCSD and the Resistance believe Careen's convincing defection, Tommy refuses to believe her loyalties have shifted. How can she be in favor of the OCSD's latest plan to monitor all minors with the Cerberean Link, a device that will track their every move? "Look around, look around at how lucky we are to be alive right now" -- I'm listening to Hamilton as I'm writing this review, and this line just came on. Fittingly poignant for this story. Ignite starts off right where Resist leaves off. Careen is still Careen, fighting for her survival and her freedom. Tommy Jr. is still in love with her. And the Resistance is helping the people and being blamed for causing the problems that it's actually fixing by the OCSD. I've read and reviewed the first two books in this series and I don't normally read and review YA Dystopians (not that I don't like them, quite the opposite, I love them but I have a hard time finding one that I enjoy that feels original). Sure The Resistance Series in itself isn't all that original. It takes its queues from all good dystopians. There are parts of this that are reminiscent of 1984 all the way to parts that remind me of The Hunger Games series. When you can list a dystopian in the same sentence as these greats -- it's a pretty good series. I really enjoyed this story. Fearing that I'll ruin or spoil anything I'm going to tiptoe through this part here. But the mental and physical abuse and subsequent reactions/feelings/actions of Careen really take this book to the next level. Lawson definitely did her research on hostages, interrogation, and re-education for this story and it shows. Those scenes might have been the most brutal and hard to read in the whole series, but they were necessary. Even how this book ends was realistic to what Careen would be feeling and going through. The ending itself is frustrating, but only because I expected this to be a trilogy. I wasn't expecting more books to come after it. I think if I'd gone into it knowing there would be more, the ending wouldn't have bothered me as much. As I stated above, the ending was totally necessary, just caught me off guard at how quickly the story was over. 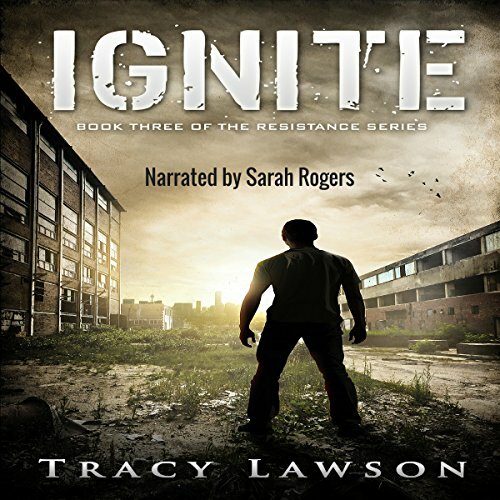 Overall, Ignite is easily my favorite book in the series so far. Lawson really hit her stride with this book. It had something for almost everyone in it too. If you haven't picked this series up yet and you enjoy YA Dystopian books, I think you should give them a try. Some books I just want to write my review and do very little talking about the book and its points, but this book -- I want to discuss it. So if anyone wants to chat with me about it, comment here, find me on twitter, or let's discuss on goodreads or something. There was so much going on in this book that I want to write about but don't want to make my review a book itself. I was given a free copy of this audiobook. It has not affected my review in any way. If you enjoyed my review, please vote for it! If you'd like to see more reviews like this check out BriansBookBlog DOT com.